The Walking Dead has become must see TV once again. Warning Signs was a densely plotted, well-written episode, loaded with stunning reveals. None bigger than the bombshell after the credits; Rick Grimes (Andrew Lincoln) has only two episodes remaining on the show. Does he live, die, or even more stunning, face a reckoning from his dearest friends? The Walking Dead's plot has gone from simmer to boil. Walkers are chowing down on a body in the night. The corpse comes back to life. It's Justin (Zach McGowan), the Savior who was mysteriously grabbed last week. As he stumbles off, "Warning Signs" is spray painted on the building behind him. Rick gets out of bed without waking Michonne (Danai Gurira). He checks in on Judith, then goes for a stroll in the garden. Alexandria has been rebuilt and is thriving. He marvels at a plump, ripe tomato. When he returns to their room, Michonne is busy working on the new charter for the communities. Rick thanks her for everything. He wants to build a new future. They make love and hope for a child. Maggie (Lauren Cohan) and Kal (James Chen) are bringing the promised food to the Saviors. Suddenly they are stopped by a group of the Savior workers on the road. They're looking for Justin. While Maggie and Kal draw their guns, Jed (Rhys Coiro) takes a tomato from the back of their wagon. Maggie demands to know his name. He says it's Mud, but Laura (Lindsley Register) tells Maggie the truth. Maggie says he will be charged for the tomato. In Alexandria, Michonne and Rick take Judith to see Siddiq (Avi Nash). She has a slight cough. They spend the rest of the morning playing and having a picnic. Rick is reading her a story when an urgent visitor comes to see them. There's trouble brewing. At the bridge camp, the Savior workers are in a standoff with the others. Justin's body has been found. They demand weapons and revenge for who killed him. Alden (Callan McAuliffe) tries to settle the crowd, but is punched by Jed. 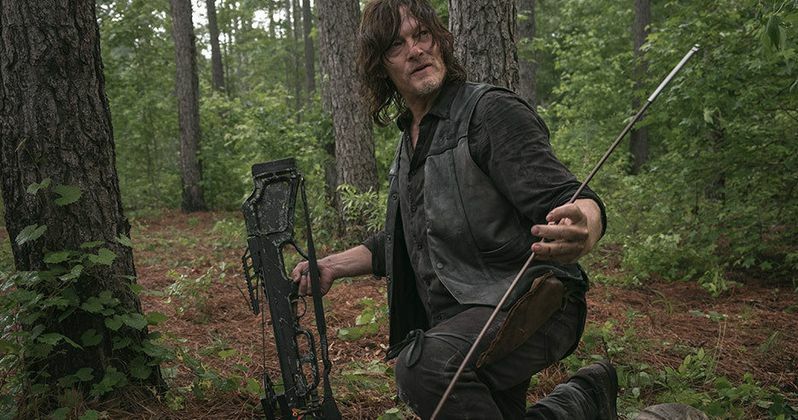 He blames Justin's disappearance on Jadis (Polyanna McIntosh) and Daryl (Norman Reedus). Carol (Melissa McBride) draws her gun, the others follow suit. Rick comes roaring into camp on horseback with his pistol drawn. He demands everyone back down. Arat (Elizabeth Ludlow) and Laura calm their Savior brethren. Rick pulls Father Gabriel (Seth Gilliam) aside. Where was Jadis last night? Gabriel lies and says they were both together on watch. He and Maggie investigate Justin's body. Next, Rick talks to Daryl. Justin was killed by an arrow. Daryl asks if Rick is accusing him. Rick says no, but he has to check. Daryl replies he would have "killed him in plain sight". Rick begs him to embrace what they're trying to build. Daryl wonders why the Saviors get a pass when Glenn, Sasha, Abraham, and their friends did not. In the mess tent, Gabriel confronts Jadis. Where was she after he left her? He's upset because of his lie. Rick splits everyone into pairs and they comb the woods for clues to Justin's murder. Cindy (Sydney Park) and Maggie come upon an old house. Sydney comments that she used to live in this area. They separate to clear the walkers. Cindy falls through the front porch and is attacked. Maggie comes to her rescue, but is overwhelmed too. Rick, Daryl, and Carol respond. They save the women, but realize another group hasn't called in. They find Beatrice (Briana Venskus) knocked out. She was hit from behind, then Arat was kidnapped. Back at the command tent, Rick assesses the situation. They must find Arat, or the Saviors will revolt. Everyone pairs up with a trusted companion and goes off into the night. Carol and Rick search together. Rick tells her that every day he thinks of killing Negan. But the world is owned by the dead. They must save lives. Daryl and Maggie discuss what's happening. Maggie admits that Rick's hope for the future is the right thing, but it may be impossible. Every time she looks at baby Hershel, she feels what was lost. They come upon a walker body with an arrow. Daryl recognizes it immediately. He knows who took Justin. Jadis returns to the junkyard. She uncovers a hidden safe, then pulls out a walkie-talkie. She turns it on and sends a message. She saw the helicopter. Have they taken anyone? A man tersely responds no. He asks if she's brought an "A or B". Jadis begs to be let out of the deal. The man refuses. He wants an "A". Suddenly Gabriel comes out behind her. He had followed her. Who was she talking to? Is that why she had initially kidnapped he and Rick? Yes, to be traded for supplies. Jadis begs Gabriel to run away with her. If they do this one request, they can have a better life in a secret place. Gabriel refuses. Jadis knocks him out; then coldly says, " I thought you were a B." Carol and Rick are in the woods. Jed and another Savior ambush them. He puts a knife to Carol's throat. Rick draws his revolver. Jed wants their guns. They'll let Carol go and be on their way. Meanwhile, Carol has slipped a dagger out of her sleeve. When Rick lowers his gun, she pivots and stabs Jed in the shoulder. She doesn't kill him. The goal is to save lives. They take him back to camp to be treated. Daryl and Maggie race back to the building spray painted in the beginning. The Oceanside women, led by Cindy and Beatrice, have Arat kneeling to be executed. They were the ones killing the Saviors. Justice for when the Saviors killed their men. Cindy tells Maggie that her hanging of Gregory gave them permission. Arat murdered her little brother when Simon and the Saviors came. He was just eleven, but Arat said "no exceptions". Arat pleads for her life, but Daryl and Maggie walk away with the cans of stolen fuel. Cindy drives a spear through Arat's skull. The next morning, the Savior workers leave the camp. They crush a tomato underfoot as they go. Jed, shoulder bandaged, is with them. Maggie and Daryl are still together. Maggie says that Rick's way has failed, "It's time to see Negan." They walk resolutely forward. I loved the tomato symbolism in "Warning Signs". Rick did grow something beautiful, but his dream of uniting the communities has failed. The Oceanside women have struck the first blow. The Saviors have left, and want their weapons back. Maggie and Daryl are aligned to kill Negan. Who was Jadis talking to on that radio? Is Gabriel in danger? What is an "A or B", and why are these people needed? The next two episodes will be the last for Rick Grimes. Multiple forces are converging against him. I can envision Rick giving his life to save a pregnant Michonne, the valiant hero always. His exit is critical to The Walking Dead's continued success. Tune in to see what AMC has in store for Rick's finale.